Make Your Move with TWO MEN AND A TRUCK! TWO MEN AND A TRUCK® is the largest franchised moving company both in the United States and internationally. With more than 380 locations and 2,800 trucks on the road today, TWO MEN AND A TRUCK has performed nearly seven million moves since its inception in 1985. Each location is independently owned and operated. "You get the best of both worlds! You get the support of a large franchise system, but you are independently owned and operated so you have a high-level of autonomy. You don't have to have experience in the moving industry because of the training that is provided to you. You also do not have to have experience owning or running a business, because again, the training and support is excellent. TWO MEN AND A TRUCK has a unique culture in that it is an open system, and seasoned franchises are always willing to answer questions and help new franchisees. It is a proven system, as shown by the consistent growth TWO MEN AND A TRUCK has experienced within the United States and beyond." Profitable Opportunity with Record-Breaking History! The TWO MEN AND A TRUCK system offers a tremendous competitive advantage over service brands. The company's state-of-the-art corporate office, proprietary software system, and training center allows for education and strategy development. As a result of the system's available tools and resources, TWO MEN AND A TRUCK franchisees continue to gain market share in storage, business to consumer, and business to business moving. With more than 200 employees stationed in Lansing, Michigan, a customer relationship center which assists franchises with booking moves after hours, large in-house training facility, and subject matter support teams available to assist in every aspect of running your business, the TWO MEN AND A TRUCK corporate team continuously delivers value to business-savvy franchise owners. The system has plans for 10% growth and 1% gain in franchise profitability this year, extending the more than six years of double-digit and continuous year-over-year growth. 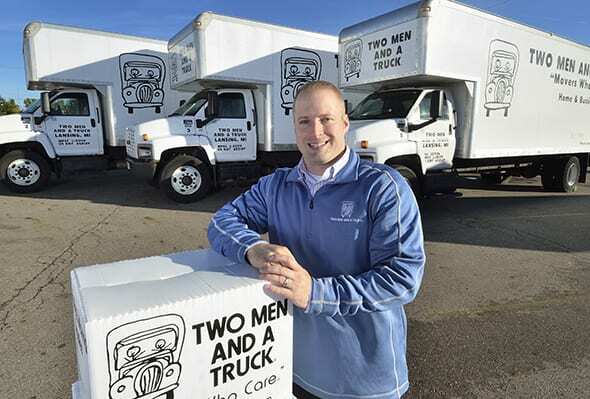 With the company's 2016 launch of the mini-market model, TWO MEN AND A TRUCK is creating franchise opportunities in several areas of the U.S., and providing moving solutions to even more customers. The mini market opportunity allows franchise owners to provide high-quality moving services in cities with populations of 100K-200K. With recent changes to the model, there are 85 mini market territories in the U.S., with many still available. By beginning your research on FranchiseBusinessReview.com, you're off to a great start toward exploring business ownership through franchising. Complete the contact form on this page to get more specific information about possible franchise opportunities in your area and explore the franchise ownership process together. We look forward to sharing this opportunity with you and chatting about the exciting territories still available for you to discover. While adding fresh ideas that broaden what we are able to do as a customer service brand, 2018 will be an incredible year for TWO MEN AND A TRUCK as we look to build on the strengths that have pushed the brand to the levels it's at today. "The TWO MEN AND A TRUCK brand is in a very strong position," said CEO Jon Nobis. "We have just completed our eighth consecutive year of strong growth on top of record customer satisfaction scores, which drives future growth. We have so much to be thankful for." Numerous initiatives will continue to accomplish system goals, from our new long-distance moving initiative, Value Flex®, to breaking new ground in the world of portable storage, and improving the TWO MEN AND A TRUCK Customer Relationship Center. These will be major steps forward for the TWO MEN AND A TRUCK brand, and we are excited to provide potential customers with even more valuable moving options. With more than 380 locations, we are able to cast a broad net and appeal to a large number of people from coast to coast, and internationally. Franchising with TWO MEN AND A TRUCK is an exciting and rewarding opportunity to own your own business, give back to your community, and work in a proven culture of success as you become part of a nationally recognized brand. When you become a franchisee, not only do you have access to an entire team of subject matter experts who care about your success, you gain access to a wealth of knowledge gathered through more than 30 years of experience in the moving industry. We're proud to set franchisees up for success! Initial investments for new franchisees typically range from $95,000 to $670,000 depending on geographic marketing area size and location. With more than 95 months of consecutive system growth, a majority of those being record growth months, we pride ourselves on providing innovative and convenient service options, and we continue to take customer feedback while conducting research on logistics and technology to offer the highest quality service and experience to customers. As we roll out new offerings, franchises across the system are implementing these new service options, which not only helps extend our reach and services from coast to coast, but gives our franchisees even more service opportunities to grow their businesses and increase their revenues. With annual rankings in national publications such as Franchise Business Review's Top Franchise Opportunities and Entrepreneur's Franchise 500 list, it's clear franchising with TWO MEN AND A TRUCK is an opportunity to strongly consider.